Largest solar bridge in the world generates enough energy for 80,000 cups of tea a day! Last month, the largest solar bridge in the world was officially declared opened. Networkrail – owner and operator of Britain’s railway infrastructure, developer Solarcentury and train operator First Capital Connect had a free hot beverage for every commuter passing through Blackfriars station in the morning, drawing attention to the fact that the bridge generates enough energy for 80,000 cups of tea a day! The refurbishing work at Blackfriars Rail Bridge in London started in 2009, when Networkrail started to modernize the underground station. 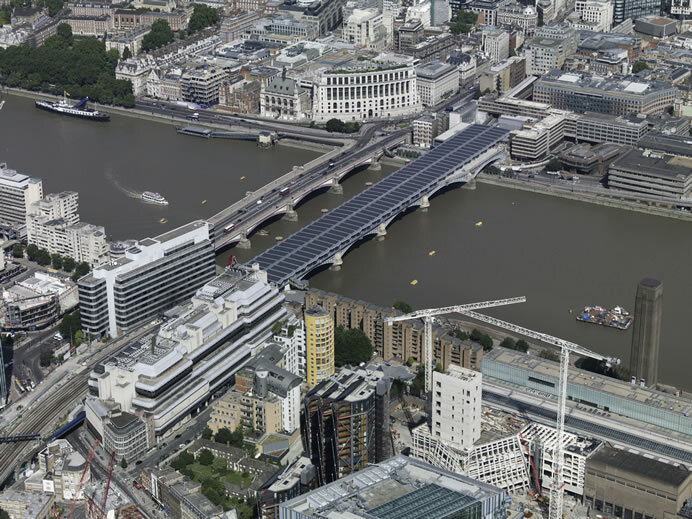 Above-ground, the railway station was extended along Blackfriars Bridge, now spanning the width of the river Thames. The station roof features 4,400 Panasonic HIT solar modules, a 1.1 MWp installation which provide around 50 % of the station’s energy consumption. The panels were chosen because of their renowned efficiency: due to the unique HIT structure.